Dennis held out his hand to give his sister some of the cookies. He had stolen them for himself so he was grumpy about sharing them. He had carefully taken a cookie each from the paper pouches in the Danish Cookies container, that way it could not be detected. There were 3 unopened containers on the dinning table and he was praying that Ma would not choose to give them away. Being a five year old had its perks. He could run around the flats in the rain, bare chested (only when Ma was not around) Nobody asked him to chop onions or empty the bin or help with the fufu. His sister, Eunice, didn’t have as much luck as he did. She grumbled under her breath and he laughed and rolled onto her side of the bed, just to spite her. She had drawn an imaginary line on the bed and he always found cunning ways to cross it. It serves her right for taking some of my cookies. When the onions Ma and Eunice were peeling started to burn his eyes, he decided that it was time to visit the neighbours. He stood at the door and yelled, ‘Ma, I am going to see Kojo’ and ran off before she could reply. The great thing about living in the flats was that there were so many lives he could live. One moment, he was the only grandson of the retired couple that lived downstairs or one of Mr and Mrs Thompson’s eight children, nine if you were counting him as well. Today he was Kojo’s twin brother. Kojo had always been his brother. They were born in the same week in the same hospital. They lived two blocks away from each other. Both mothers had gotten used to the fact that either son could spend the night in one home or the other, so they both had spare clothes in each other’s homes. Dennis liked being at Kojo’s house because his mother always had a snack for them. Today it was Refresh and Cabin biscuits. They were lying side by side on Kojo’s bed, playing the ‘whose legs are longer game and dirtying the wall in the process. He liked Cynthia, Dennis that is. He made it a point to casually stroll in front of the shop and ask for a balloon. Even though he knew that there was no way that he will win the biggest balloon, no matter what he did, he kept going back and poor Kojo went with him. Cynthia was 7 and way out his league but he wasn’t interested in winning. He just wanted to be close to her. Soon a hand came to take his money and give him the balloon. Cynthia’s hand. 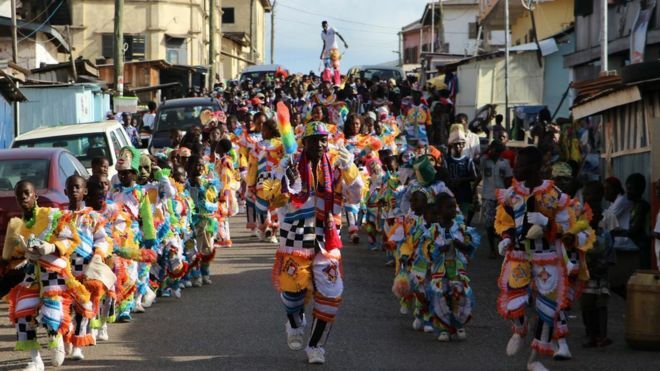 The christmas masqueraders aka eemaasi aka ka ka moto bi. They were drumming and dancing to their own music, advancing towards Dennis. Oblivious, of course, to the horror unfolding in his 5 year old heart, the masqueraders chanted and inched closer by the second. He could feel the urine travelling down his trousers so swiftly. He was frozen to the ground, caught between begging his legs to run for his life and praying that Cynthia would not see that he had wet his trousers. Ever faithful Kojo grabbed Dennis’ hand and started running. They ran back to Kojo’s house to change clothes before any of their mothers could see them. They stood in Kojo’s room, panting as though they had just finished a 80km marathon. It was their favourite- rice, corned beef stew and boiled egg. Outside, it was getting dark. The new joint Fridays was playing loud music- on a normal day, it would have been annoying but this time it was fun. It was like a big communal party. Later that evening, everyone came to sit outside- Mr Kuma with his cat, the Oforis, the Thompsons, the Agbekos, the Frimpongs and even the Schandorfs who never took part in anything. They were nibbling on finger food, chatting and lighting firecrackers. The first firecracker that went off was fired by Mr Agbeko. The kids were both excited and scared. Dennis peered in wonder from behind his mother’s skirt, at the colourful lights dancing in the sky. He soon mustered courage to run up and down the road with Kojo, their eyes fixed on the lights, the unfortunate incident of the afternoon forgotten. He could deal with his Cynthia problems later. Tonight was about chasing the lights with his best friend. After all, what was Christmas to a five year old, if not a festival of lights and love? the joy of celebrating Christmas use to be unimaginable unlike in recent times…tanks. Ahahahaha the masquerade bit got me! I have a cousin who is 30 and is scared of kaakaamotobi. Good job! Really enjoyed reading. Refresh ☺ my favorite drink growing up. Good read as always. *contended sigh* Merry Christmas Keni! Btw, eemaasi still rub off on me the wrong way… Fridays tho..still dey pap right? Mr Kuma and his cat? 😂lemme guess it must have been call blackie! Thanks for bringing back the nostalgia of the nineties! 😂😂 you know a Mr Kuma who has a cat? My pleasure, Judith!